4) Take the button above and post about it on your blog. Use the Mr. Linky below to sign up and make sure you link it directly to your post about this challenge not to the home page of your blog. 5) If you don't have a blog, that's fine. Just leave a comment to sign up and tell us which series you are reading. Or you can join my Goodreads group for this challenge by clicking here. IF YOU WANT TO LINK UP YOUR REVIEWS, THERE WILL BE A MR. LINKY FOR COMPLETED REVIEWS OR, FOR THOSE WITHOUT A BLOG, LEAVE A COMMENT BELOW. After you complete the challenge, you can link your wrap up posts on the linky below. Please be sure you put the direct url to your wrap up post or to a list of the books you completed for this challenge. I'm definitely going to be in for this one. I'm going to try for at least level 2. Marvelous! Just the impetus I need for a couple of them. I saw this one late yesterday, but didn't have time to really do anything and now I come back to see two more. Can hardly wait to see what they're about too! I'm in again. Level 3. Will be finishing this year's challenge soon. this will be my first time and since I got a couple of series i would plan to finish next year I decided to join. does sequels count as finishing a series? for example Winger by Andrew Smith and To all the boy's I've loved before by Jenny Han are coming out with a sequel. I'm highlighting 3 series to focus on next year. There are several others that I also plan to keep reading like Hamish MacBeth mysteries by M C Beaton. I'm doing level four! I have so many series I need to catch up on! 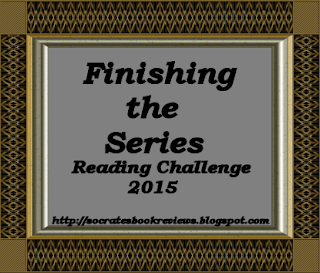 I am going to use this challenge to finish the Agatha Raisin series -- unless she keeps writing books! Thanks for offering this challenge. I need the incentive. I'm really good at starting a series. I'm aiming for Level Experienced. I'm going to try to finish the series I didn't in 2014. Thanks for hosting again, Yvonne! I'll keep track on Goodreads. Woo I'm apart of the challenge! Best of luck everyone. Your Pizza Lovers series looks intriguing. I'm going to try it...my local library has the series available in ebooks, yay! Yey! So excited for this! I've been looking for a finish your series challenge for a while but erm now I feel like I've got issues because I've got about 25 series I want to finish/get caught up on this year! 14 of them though are just one book so it's not too bad. I really got behind last year. I have so many series to finish. Too many, really. So I'm going to stick to just five, because I like fives. I've signed up for level 1 for now - am I able to increase if I find enough time later in the year to do another series? Yes, you can always increase. I've signed up for level 4, because I have lost count of the number of book series I have left to finish. Committing myself to finishing at least four over the course of the year seems like a good goal. Gah! I posted my latest review in the wrong place - it was NOT meant to be my round-up post (although I finished my first four series ages ago). Could you move it to the normal links, please? I posted my review for Red Glove in the wrong place. 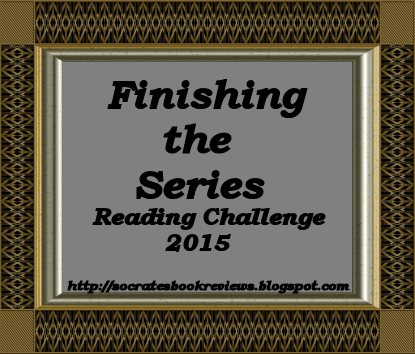 It's not supposed to be with the wrap-up links (because I'm no where near finished with the challenge, even though I've finished 4 series). Please move it. Thank you. No problem. I moved it to the review link. Are you hosting this again in 2016? I haven't decided yet. I haven't read anything towards this challenge myself this year. Yes, please host the challenge again! I always join in. It's a great incentive to keep up with series I've started. I started the Pizza Lovers mystery series when I saw your list of the series books above, liked the first one and look forward to reading more of the series next year. Hope you'll host again. I finish more series with the incentive. Bea from Bea's Book Nook is taking over the challenge. She'll do a great job. I hope you'll join her challenge. My link for Emerald Green when in the wrong linky! It is under wrap-up post and it isn't supposed to be. If you can remove it, that would be great.